Female steelhead trout are killed to extract eggs from their bellies. 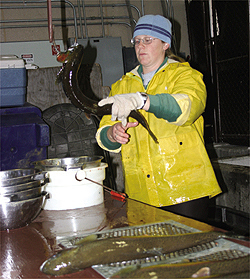 At the Sawtooth Fish Hatchery south of Stanley, Randi Hufford collects eggs and deposits them in buckets. Baseball is a numbers game put into motion by physical action.